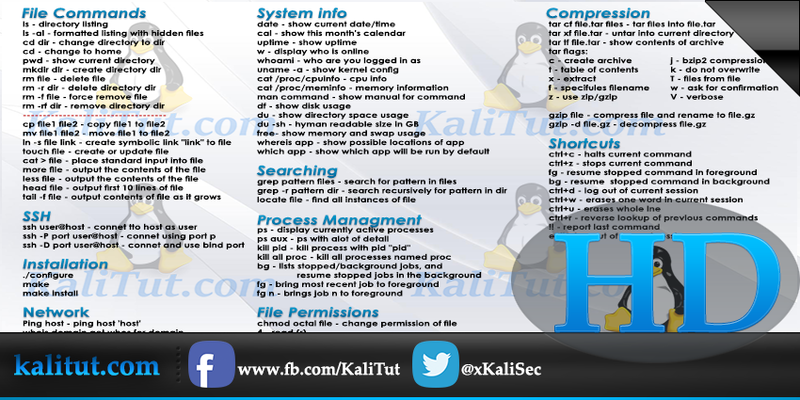 it will help you to learn them quick and become a Linux expert very soon. 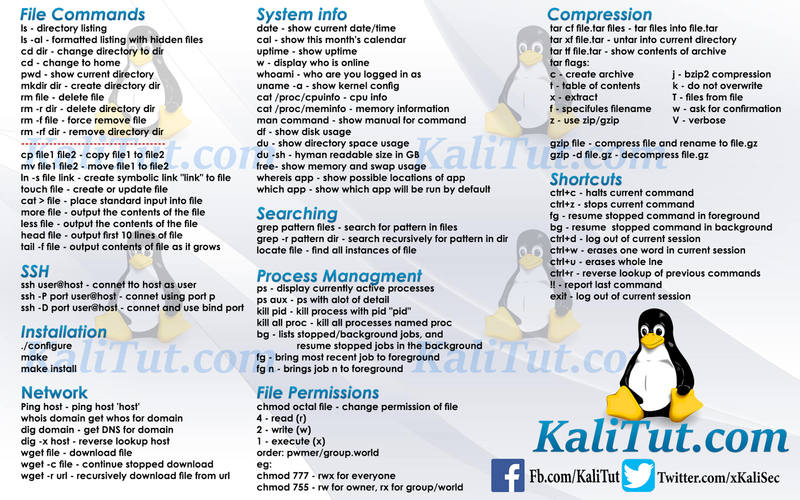 1) The ls Linux command lists files and directories within the current working directory. 2) The cd Linux command changes the current directory in Linux and can toggle between directories conveniently. 3) The pwd Linux command (print working directory) command displays the name of the current working directory. 4) The mkdir (make directory) command is used to make a new directory. 5) rm (short for remove) is a Unix / Linux command which is used to delete files from a filesystem. 7) mv (short for move) is a Unix command that moves one or more files or directories from one place to another. 8) The link command creates a hard link named FILE2 which shares the same index node as the existing file FILE1. Since FILE1 and FILE2 share the same index node, they will point to the same data on the disk, and modifying one will be functionally the same as modifying the other. 9) The touch command updates the access and modification times of each FILE to the current system time. 10) cat command It has three related functions with regard to text files: displaying them, combining copies of them and creating new ones. 11) more is a filter for paging through text one screen at a time. 12) The less command lets an admin scroll through configuration and error log files, displaying text files one screen at a time, with backward or forward moving available in files. Unpack the archive and cd to its base directory. 2) whois searches for an object in a WHOIS database. WHOIS is a query and response protocol that is widely used for querying databases that store the registered users of an Internet resource, such as a domain name or an IP address block, but is also used for a wider range of other information. 3) The command dig is a tool for querying DNS nameservers for information about host addresses, mail exchanges, nameservers, and related information. 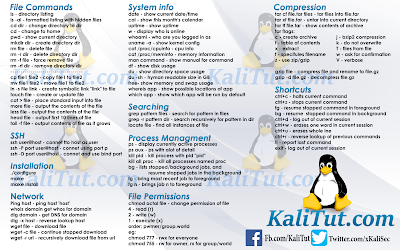 This tool can be used from any Linux (Unix) or Macintosh OS X operating system. The most typical use of dig is to simply query a single host. 4) wget is a free utility for non-interactive download of files from the web. It supports HTTP, HTTPS, and FTP protocols, as well as retrieval through HTTP proxies. 1) The date command is used to print out, or change the value of, the system's time and date information. 2) Display a conveniently-formatted calendar from the command line. 3) uptime tells you how long the system has been running. 4) The w command is a quick way to see who is logged on and what they are doing. 10) On Linux and other Unix-like operating systems, man is the interface used to view the system's reference manuals. 12) du command estimates and displays the disk space used by files. 14) Linux whereis app command Locates the binary, source, and manual page files for a command. 1) ps displays information about a selection of the active processes. kill pid - kill process with pid "pid"
3) bg is a job control command that resumes suspended jobs while keeping them running in the background. 2) Gzip reduces the size of the named files using Lempel-Ziv coding (LZ77). Whenever possible, each file is replaced by one with the extension .gz, while keeping the same ownership modes, access and modification times. Thank you for the command list, very useful commands!